Tom is currently studying abroad at the University of Geneva with his French and Economics degree at Reading. We catch up with him half way through his year abroad in Switzerland! So much has happened in the past 5 months that I don’t think it’s possible to capture it all in writing. It’s been a semester that’s had some serious highs and equally some serious lows, but ultimately my time here so far has been an experience that I wouldn’t change for anything. It would be best to start off with the university; I have found the learning dynamic to be far different from Reading. Sure enough the classes and lectures follow a similar format to that of back home, but the feeling of a unified student community is lacking. This can mostly be attributed to the fact that the University of Geneva is not situated on a campus – the buildings are instead spread out across the city. This means that as you head to a lecture it feels as if you are going to a job, this is amplified by the general hard-working attitude of Swiss students who are reluctant to socialise before and after class. Lastly there are very few societies that students can join making it difficult to branch out past the Erasmus group. In general the courses are quite demanding but also very engaging. Learning in French has proven difficult, as although I’m able to understand the material the problem is being able to retain information in French. The bulk of the “lows” that I have faced are thanks to my accommodation. When I arrived I was renting a room in a house that was simply too far from the centre/university, a 30-minute uphill cycle ride home each day put me in great physical shape but left me feeling disconnected from everyone. After a month and a half I moved to a room that was perfectly situated but then I shortly realized that living there was not an option – an old and smelly single mattress tucked up in the corner of a room in an apartment owned by a heavy pot-smoker who had the TV on full volume until 2am most nights made me feel very uneasy and it took a serious toll on my studies. I was then able to sub-let a room in the student residence whilst I awaited the move into my official room there as of the next semester – this came as a relief as I was surrounded by students in a comfortable and secure atmosphere. My favourite part of this YA so far has been the sheer amount of travelling that myself and friends have been doing. So far I have visited Zurich, Lyon, Budapest, Rome, and Barcelona as well as day trips to other neighbouring towns in France/Switzerland. This has been wonderful as you are with a group of people who share the same enthusiasm to get out there and discover things. To fund all these activities I have secured a job as a babysitter for a Swiss family; the children are exhausting, but they often (indirectly) help by correcting my French which is something that adults refrain from out of politeness. At the start of January I volunteered in an independent film festival called “Blackmovie”, it was really fun to take part in something that I usually wouldn’t consider doing in the UK and I was able to make a connection with a few of the locals. With the coldest days of winter behind me and a new semester on the horizon I am thrilled to see what the next few months will bring. 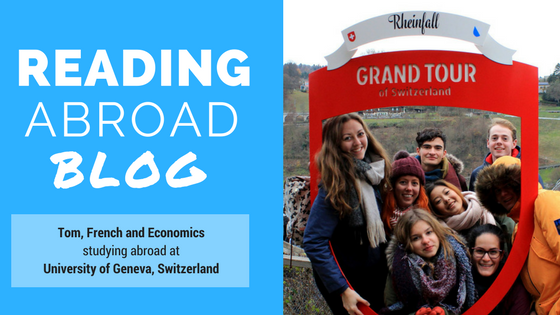 This entry was posted in Switzerland Study Abroad and tagged 2016/7, Economics, Europe, French, Study Abroad, Switzerland, University of Geneva. Bookmark the permalink.